My Spidey-sense is tingling! Is there a storm on the way? Like Spider-Man, spiders release a line of silk and then LEAP into the air. This is called ballooning, and it’s how spiders travel far and wide. Some can even reach heights of over two miles! How are the tiny arachnids able to get so much air so easily? Erica Morley at the University of Bristol put spiders in a metal box and gave them a tiny shock. 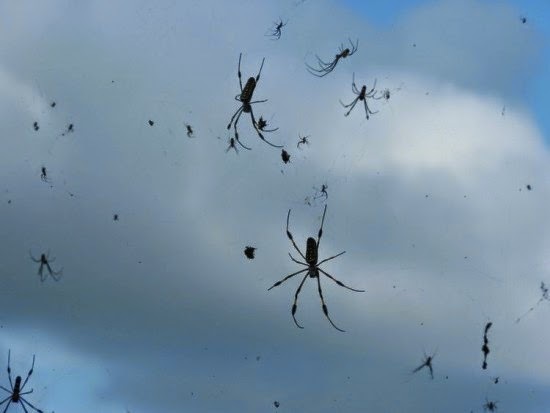 Inside, the spiders felt electricity resembling dry, misty, overcast, or stormy weather conditions. A carefully placed camera captured every attempt at ballooning. Results? More electricity equals more leaps! The spiders know when to balloon thanks to their hairy legs! Their hair perks up as they sense electricity in the air. Frizzy-haired listeners, you know what I mean! Under hair-raising weather, spiders can get the most mileage out of ballooning. Morley has found that bumblebees also sense electricity. If spiders can, too, perhaps ALL bugs have this super-power! In related news, Marvel supervillain just Electro announced his retirement!